Credit ratings shop has made the same payout for more than a decade. Predictive analytics specialist FICO (NYSE:FICO) announced yesterday its second-quarter dividend of $0.02 per share, the same rate it's paid every quarter since at least 2000. The board of directors said the quarterly dividend is payable on June 12 to the holders of record at the close of business on May 28. The regular dividend payment equates to a $0.08-per-share annual dividend yielding 0.2% based on the closing price of FICO's stock on May 15. 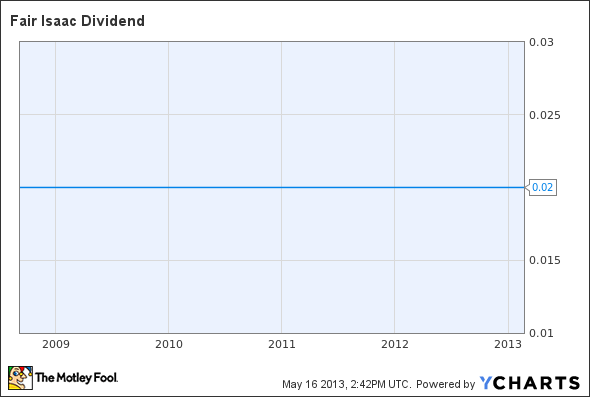 FICO Dividend data by YCharts. Your FICO score is one of the key numbers that determines your creditworthiness and the interest rate you'll pay on loans.